A mail-order bride moves to Montana, determined to find a better life, but instead finds an odd combination of safety and danger as she struggles to make a place for herself in her new community. Threatened by their Chicago landlord, Emilia Stanek accelerates her plan to marry the rancher she met through a newspaper ad and flee to Montana with her brother and sister. After marrying Finn by proxy and taking a train to Helena, she learns he’s been murdered, and the sheriff—Finn’s best friend, Mac—wants them to return immediately to Chicago. Emilia refuses, then takes on the responsibility of paying off Finn’s substantial debt. For the most part, the community embraces the family, and Mac is intrigued by determined, beautiful Emilia. But as he investigates the murder, some unsavory rumors mushroom around Finn and the Staneks, and he questions the true nature of the man he loved as a brother. Mac wants Emilia to marry him, which will take care of her financial obligations and the stain on her reputation, but Emilia resents his interference even though she’s falling in love with him. Trying to get to the bottom of the rumors and his friend’s death, Mac deals with a pesky reporter as well as his mother, a local brothel owner, but things get murkier rather than clearer, especially when a town clerk also winds up dead. In the end, both Mac and Emilia must overcome doubts and decide to trust in love, friendship, family, and community. Co-authors Welborn (Sugarplum Hearts, 2017, etc.) and Whitham (The Gift of the Matchmaker, 2016, etc.) launch a new series, Montana Brides, with a dauntless, winning heroine, a complex hero, an engaging supporting cast, and a light message of faith, plus an interesting though confusing—and unresolved—murder mystery, with an “epilogue” which is more of an enigmatic introduction to Book 2. 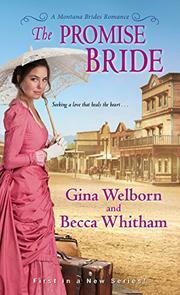 Sweet and appealing, this historical inspirational romance hits a nice tone as it touches on a variety of themes.